Prime Minister Narendra Modi has announced the launch of the Ayushmann Bharat Scheme ie National Health Protection Scheme (AB-NHPS) on the occasion of Independence Day. Under this, about 10 crore poor families get annual health insurance of Rs. 5 lakhs. After this, middle class will also get the benefit of this scheme. Health centers have been started in the first phase under the life insurance scheme. On September 25, it will be launched on Dindayal Upadhyay Jayanti. Under this, people will get free health coverage. Now the question arises, how can the general public benefit from the National Health Protection Scheme (AB-NHPS)? How can the patients benefit from this scheme ? 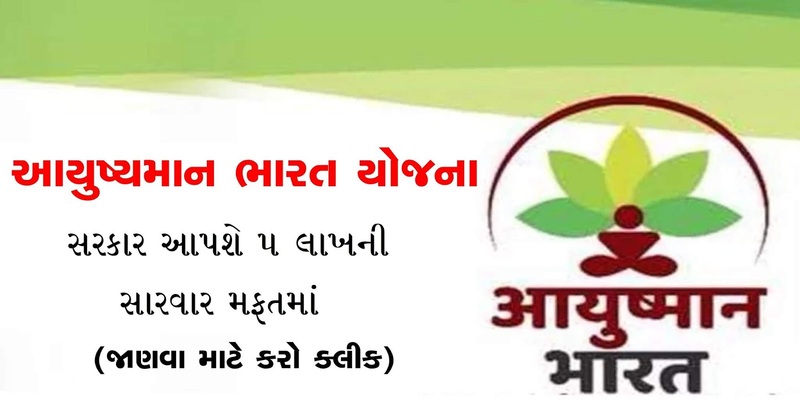 Ayushman Bharat Scheme aims to benefit 50 crore people. Only about 10 million people will get the benefit in the first phase of the project. Besides, this plan will be fully cashless. That is, under the National Health Protection Scheme (NHPS), the insured person will not have to spend any rupee for his treatment. During the treatment, the government will raise rupees five lakh rupees. Under the Life Insurance Scheme, the government will recognize the people themselves. In fact, those who live below the poverty line in the 2011 census will get a place in that. So, you have to know first in your panchayat. Apart from this, the government will soon provide online tools. Through which you can get information. If you are eligible for this plan, you will be able to register for this scheme. This software is currently undergoing testing. Under the Ayushmann Bharat Scheme, the insurance holder will first have to give his insurance related documents to get treatment under. After this, the hospital management will inform the insurance company about the cost of treatment and cashless treatment will begin after the insurer's documentation is confirmed. Under this scheme, the insured person can be treated not only in government hospitals but also in private hospitals. The government has started the process of connecting private hospitals with this plan. 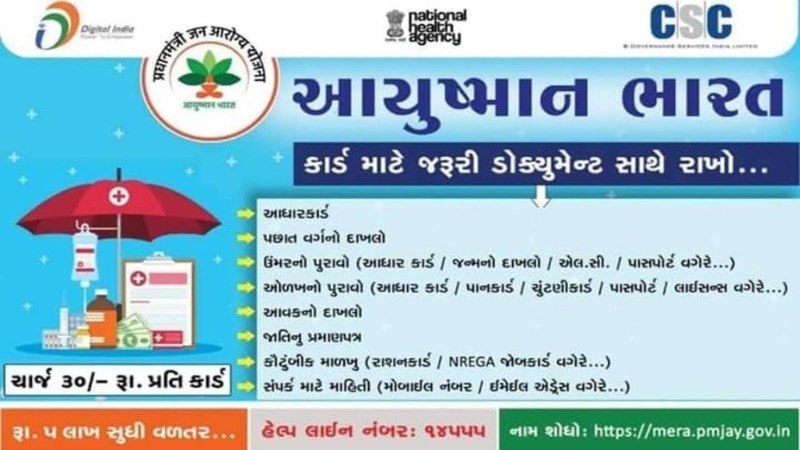 Aadhaar card is not required for Ayushmann Bharat scheme. According to the Supreme Court order, any government scheme can be benefitted without the support card even in the country. Maternal health and delivery facilities, newborns and children's health, juvenile health care, contraceptive services and infectious diseases, non-infectious diseases, eye, nose, ears and throat disease will be separate units for treatment. Apart from this, there will also be facilities for the treatment of the elderly. At present, 17 hospitals have been sanctioned in Gujarat. As per the requirement of the people, the yoga will be expanded gradually. Our good wishes to be happy and healthy are you. Nevertheless, when the sickness comes. And when it comes to cost, it is a matter of concern for the people. Prime Minister Shri A. has removed this concern. Under the Health Wellness Centers, the primary health centers will be updated across the country. These centers will also get free medicines with treatment. Under which, there will be 1000 in Chhattisgarh, 1185 in Gujarat, 505 in Rajasthan, 646 in Jharkhand, 700 in Madhya Pradesh, 1450 in Maharashtra, 800 in Punjab, 643 in Bihar and 255 wellness centers in Haryana. It is noteworthy that under this scheme, the government will open more than 1.5 lakh health and wellness centers across the country, which will provide essential medicines and diagnostic services for free. Your family name could be covered in the PMJAY beneficiary list. To check out if you are a beneficiary, you can login here using your mobile number. You do not need to enroll anywhere to claim benefits under the scheme.